Lemon Cakes. 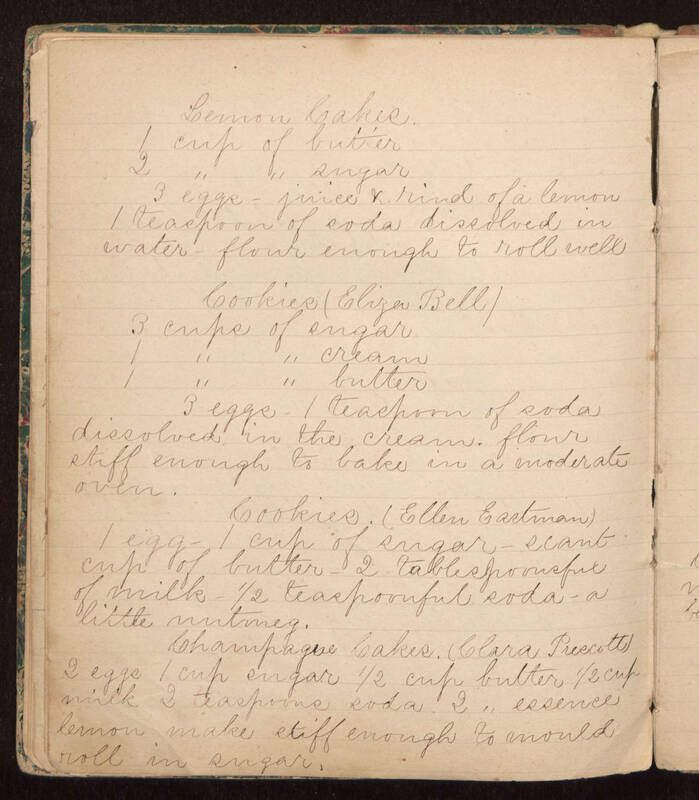 1 cup of butter 2 " " sugar 3 eggs - juice & rind of a lemon 1 teaspoon of soda dissolved in water - flour enough to roll well Cookies (Eliza Bell) 3 cups of sugar 1 " " cream 1 " " butter 3 eggs. 1 teaspoon of soda dissolved in the cream. flour stiff enough to bake in a moderate oven. Cookies. (Ellen Eastman) 1 egg - 1 cup of sugar - scant cup of butter - 2 tablespoonsful of milk - 1/2 teaspoonful soda - a little nutmeg. Champagne Cakes. (Clara Prescott) 2 eggs 1 cup sugar 1/2 cup butter 1/2 cup milk 2 teaspoons soda 2 " essence lemon make stiff enough to mould roll in sugar.